Please note the photograph is of the 20 plate model not the 30 & that we source from more than 1 distributor. 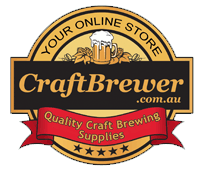 CraftBrewer brings you the Chillout a fast way to chill your wort to yeast pitching temperature to get your fermentation off to a quick and healthy start. 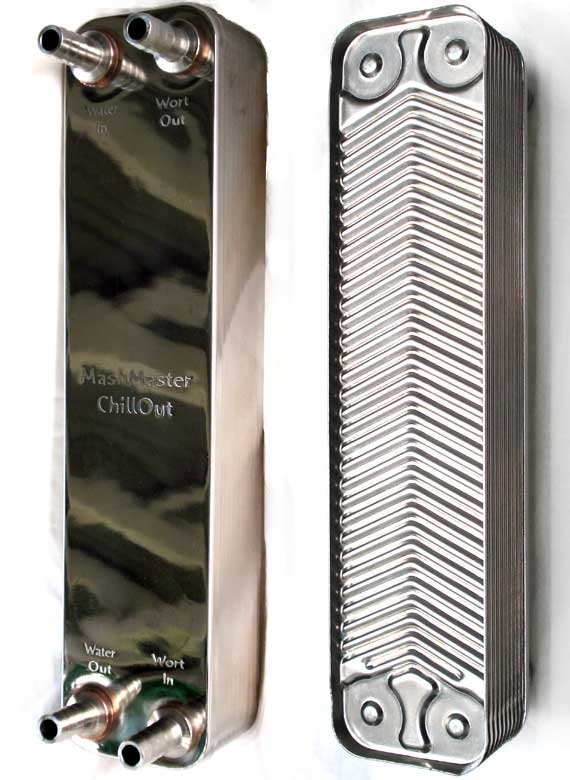 The ChillOut is a plate type heat exchanger, a miniature version of the plate chillers that the pros use. The ChillOut is made of 30 plates of 304 Stainless Steel that have been brazed together with pure copper in an oxygen-free furnace. The ChillOut has small ripples up and down each plate. This creates more surface area for the wort to travel over and more time for the water to cool the wort down. More importantly the ripples on each plate create a turbulent flow, eliminating laminar flow to ensure the wort cools fast. The ChillOut uses less water than a conventional immersion or counterflow chillers. It is especially great for brewers in hot climates! The ChillOut has 14 wort flow paths providing low restriction, making it ideal for gravity feed and reducing the risk of plugging from hot break and hop fragments. Wort may be pumped or gravity fed through the chiller. The fittings are sanitary hose-tail barbed fittings, just stick the hose over the top and clamp it up, no threaded fittings which can harbor nasty bacteria. Ultra compact measuring 315mm x 73mm x 73mm (not including fittings) the design allows for any easy integration into any brewing setup. Great value compared with less efficient counter flow chiller designs. Cleaning a plate chiller is a bit more involved than a normal immersion chiller, due to the tiny pockets created by the channels in the plates. These pockets can harbor cold break material, hop remains, or any other solid, and if not removed can cause infection in subsequent batches. The best way to clean is to recirculate a solution of hot water and Sodium Percarbonate (Napisan) or Powdery Brew Wash (PBW) through the chiller as normal, then back flush the chiller. Pushing cleaning solution into the "Wort Out" side and out of the "Wort In" side. This should remove any that may have gotten trapped by the ridges on the plates. Mount the ChillOut vertically with the writing on the name plate facing up. For pump and gravity setup to avoid air being trapped in the water flow it is suggested that water out be raised above the height of the water in flow. It is important to ensure that you use a good pre-filter to prevent hops clogging your ChillOut. Hot Liquids are in use please ensure that all connectors and hoses are secure before use.